I didn’t care for the fall ‘half’ of series 7. In fact, I’m willing to extend that sentiment to the entirety of series 6 as well. But I’m excited for these new episodes in spite of my previous misgivings, simply because I can’t help myself; I like this show. I like this weird, funny, sometimes amazing, and occasionally disappointing sci-fi show. And I hope with all the hope left in my tiny, cynical heart that maybe this series (or ‘half series’) will be consistently good. 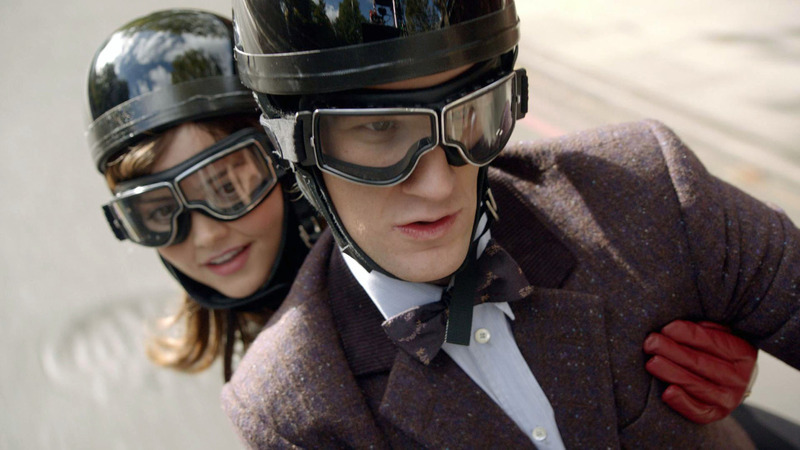 Quickly re-capping: The Doctor continues his search for the next incarnation of Clara ‘Oswin’ Oswald to no avail. Naturally he’s a little disappointed by this, so he does what any mature time-travelling space alien would do – he secludes himself in a monastery and sets up what could only be described as a ‘stalker den’. It’s a dimly lit room with a large portrait of Clara which, I would assume, the Doctor painted. But his on-screen misery is short lived. The Doctor receives a call on the TARDIS’ exterior phone (referred to by a monk as the ‘Bells of Saint John’) and through some miraculous twist of fate Clara’s the caller. Is this cosmic coincidence foreshadowing future events, or is it just lazy writing? I guess it depends on how jaded you are. Either way, the Doctor promptly appears at Clara’s door much to his joy and her confusion. The Bells of Saint John marks the third time Jenna-Louise Coleman has appeared in the show, albeit the first time she’s been an ‘official’ companion. As Clara she’s charming, witty, and adorable. She also grew on me surprisingly fast (although given that her previous appearances as Clara were similar in characterisation perhaps it’s just the déjà vu that won me over). The banter between her and Matt Smith’s Doctor produced some of the better moments in the episode. Speaking of the positives, another great scene is when Clara first enters the TARDIS. It’s one continuous shot that goes from the street, into the TARDIS, and then out onto a passenger jet. My description is lacking, but hopefully if you see/have seen this episode you’ll know which scene I’m describing and how visually neat it was. But it wouldn’t be Doctor Who without an element of danger. This time, there’s something in the wi-fi. Specifically, there’s an organisation using wi-fi to steal the consciousness of unsuspecting people. Apparently with everyone using mobile phones and laptops finding potential targets for ‘uploading’ is easier than it sounds. It might be feasible to construe this as social commentary on the ubiquity of social media and online interconnectivity in our modern world, but I’m not in favour of looking to Moffat’s work for meaningful discourse on society. I will say that he seems to be a fan of having the Doctor appear on screen wearing a heavy, hooded robe, obscuring his identity for all of two seconds before ‘dramatically revealing’ himself. It happened in A Good Man Goes to War, it happened in The Wedding of River Song, and it happens again in this episode. I understand that perhaps in this instance, given that it’s a quasi ‘series premiere’, seeing the quasi titular character for the first time warrants some sort of reveal. But who are we kidding? We know it’s the Doctor. It’s always the Doctor. This isn’t the only example of Moffat recycling ideas either… (spoiler) the Doctor ultimately saves the day with the help of a look-alike robot proxy à la the Teselecta (the shape-shifting spaceship thing filled with tiny people that showed up in Let’s Kill Hitler and The Wedding of River Song). Nonetheless after The Bells of Saint John I still have hope for this series, which I guess means that this episode did more things right than wrong. Is it particularly memorable? Not really. But at least it’s enjoyable. I’m with you. It feels like letting go of the Ponds and River has at least given me a little hope that the whole series will get unMoffated. It’s a shame, because I really loved the show during season 5… hopefully Clara doesn’t turn out to be some silly nursery rhyme come to life.